Leocadia "Lee" E. Karczewski (nee Godfryt), age 94, of Florham Park, passed away on Sunday October 7, 2018, at the Morristown Medical Center. Born in Bayonne, to Bronislaw and Cecilia Godfryt, Mrs. Karczewski was a longtime resident of Cranford before recently moving to Florham Park. 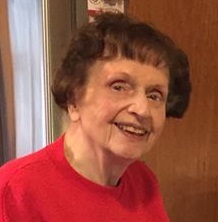 She worked as a teachers aid and administrative assistant in the Cranford school system for 18 years before retiring in 1982, and was a loving mother and homemaker to her family. Mrs. Karczewski was an avid member of the Senior Citizens Club of Cranford for many years. Beloved wife for 49 years of the late Theodore (1996); She is survived by her son Robert and his wife Lesley of Boonton and 2 grandchildren Ted of Seattle, WA and Margaret of Brooklyn, NY. Relatives and friends are kindly invited to attend the Funeral on Friday October 12, 2018, at 8:30 am, from the Krowicki Gorny Memorial Home 211 Westfield Ave. Clark, thence to St. John the Apostle R.C. Church, Linden, where a Mass of Christian burial will be offered at 10 am. Interment, St. Gertrude Cemetery, Colonia. Visitation Thursday from 5-9 pm. Kindly visit www.Krowickigorny.com to offer condolences or flowers.